Our waitress came back a few minutes later with our coffee, skim and honey, but no water so we asked again. The coffee, I’m sorry to say, left a lot to be desired. Although it was hot and topped off frequently by a team of staff, it was so weak and flavorless that it really needed the skim and honey even more than it normally would. 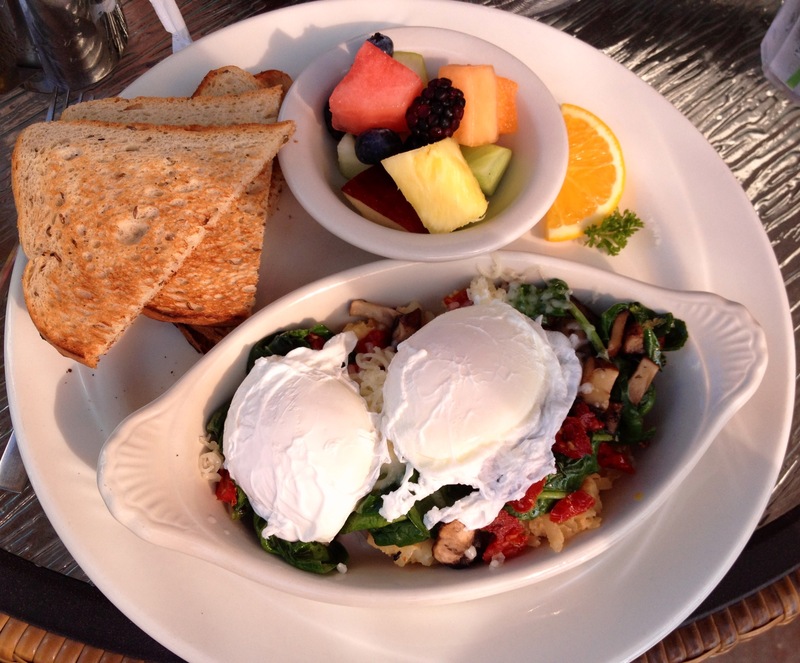 For my breakfast, I ordered the Ken’s Bella Veggie Skillet: 2 Eggs ‘your way’ (I had them poached), sautéed Portabella Mushrooms, Spinach, Sun-dried Tomatoes & Swiss Cheese over potatoes with a side of fruit salad and rye toast. I asked for my toast dry with butter on the side. My meal came out lightening fast and looked great with lots of veggies and 2 perfectly poached eggs. I dug right in and was pleased with the combo of flavors and textures. The only thing that wasn’t great was the soggy/cheesy potatoes that the whole thing sat atop. I was hoping they’d have some crispy edges, but no, not even a little. The fruit salad was a nice refreshing side, full of fresh melons, berries and apples. Unfortunately, the waitress had forgotten my butter for my toast so I reminded her again. I’d finished about 3/4 of my meal before she finally came around again and I asked for a 3rd time. When she finally brought it out I was just about done eating my meal. Well, better late than never I guess. Our check was brought over and our ‘pretty good’ food quickly turned into ‘totally not worth it’. Even WITH our $5 credit, the total plus tip came to $30. That’s just ridiculous. We are NOT in NYC anymore and charging more than double what a breakfast at a great NY diner would charge is insane. Yes, the setting is cute. Yes, the menu had great choices and the food was tasty…but NO, not worth $30 at all. I will not be going back.